More examples of Indigenous figures in Canadian glass are here. 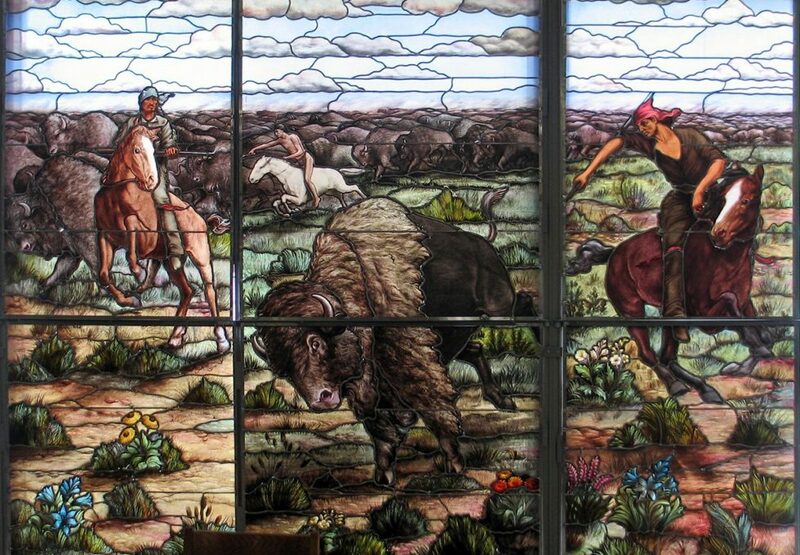 This spectacular window is based on a painting by the American artist Frederic Remington (1861-1909.) Removed from a Winnipeg mansion scheduled for demolition, the window is now at the Manitoba Museum and was restored in 2016 after years of neglect and damage. Stained glass studios of the 19th and early 20th centuries often “borrowed” designs of favourite paintings by a famous artist at the request of a well-to-do client. But something is wrong with this picture: the spear that Remington depicts being thrust into the buffalo does not reach beyond the its panel. Was the window abbreviated at some time during its 110 year life? We would like to know.